Ambria has more refugee camps than the government of Queen Korinthia would care to admit. The sluggish trickle of travelers across The Titans from the blighted lands of Alberetor has settled in lumps and clumps. Those who survive the journey to their new home seem confused and more than a little resistant to change. The Queen wants to see order and progress. Her governors and bureaucrats want to see labor put to good use and newcomers distributed evenly across the fledgling nation. That even distribution rarely happens. Many linger in the camps or strike out on their own. Free Colonists have become a nightmare to handle as families find their own way and set up wherever they please. Free spirits do not make for an ordered nation, and never serve the common good. Even on the outskirts of Yndaros, the capital itself, the slum dwellings amount to little more than a refugee camp with a measure of permanence. However, too many people have settled their now to do anything about it without mass action by a military already too stretched to handle civil unrest as well as all the more important matters. Just north of the Mountain Pass in the shadow of The Titans lies Camp Titan. The first place that the people of Alberetor made camp after their journey across the stormy peaks, it has significance. However now it serves as a reminder of Ambrias problem – the issue of colonists from Alberetor not following ‘the plan’. Colonists who do not continue their journey rarely get registered and do not receive assignment plans to scattered them across Ambria for the betterment of the nation. Administrative ministries from the north have come to attend to the inhabitants of Camp Titan on more than one occasion, but even after rehoming the colonists there it simply refills in a matter of weeks. Camp Titan has seen fire, sickness, bandits, corruption, crop blight and more – but it lingers like a bad stain. Protected by a wooden palisade offering some defense from harm and protection from the wind, refugees make camp and just stay. When the inside fills, travelers camp outside. Eventually, something happens to scare the inhabitants away – or kill them, burn them, sicken them or otherwise send them packing; but soon others take their place. Over time the inhabitants of Camp Titan have set up amenities that make the stay easier. The camp has a permanent well fed from a spring that flows from the woods to the north. At one time someone scavenged enough stone to create a simple bake-house, with an oven and chimney, set against the inner east wall. A priest of Prios rallied the people to build a small chapel on the outside of the wall just north of the west gate and established a graveyard not far from the walls to the north-west. Over the last several years, farmers have prepared the land between the camp and the stream to the north and managed to grow crops. What they harvest means that the bakehouse isn’t reliant on the supplies carried across the Titans or offered as donations from the north. The fields also provide root crops. It isn’t easy going as the land isn’t especially fertile, but the refugees have a singular determination. I have used the camps – and specifically Camp Titan – as a good way to show the measure of the game to newcomers. The sight of a struggling camp, generally facing some fresh challenge, gets the players to understand the harsh realities of Ambria. The world of Symbaroum isn’t about high adventure and sparkling towers of magic – people living in Ambria have to fight to survive against the elements, hunger, and disease. I don’t intend to depress people, but use that as a way to show that the characters they play have adjusted to the new world and have worked hard to make something of it. They have the chance to rise if they work hard and take risks. Perhaps, they can make a difference for other, too. 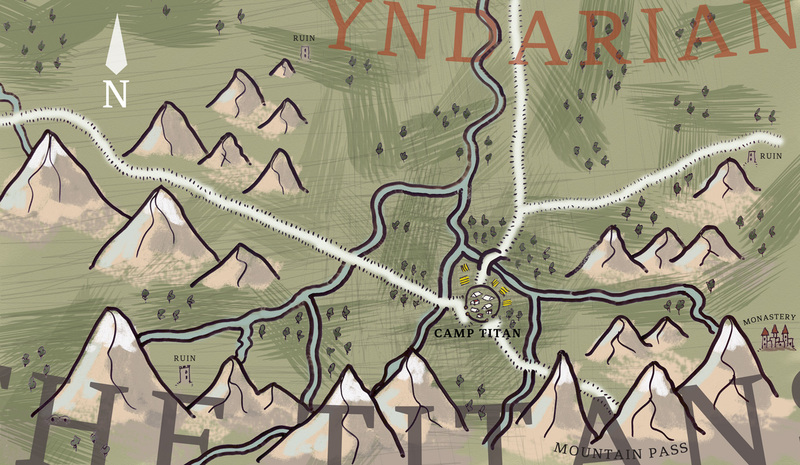 Camp Titan has some potential for new characters as they travel across the Titans as a first place to see what Ambria holds for them. Travels here can provide information and the Camp provides a place to stay. 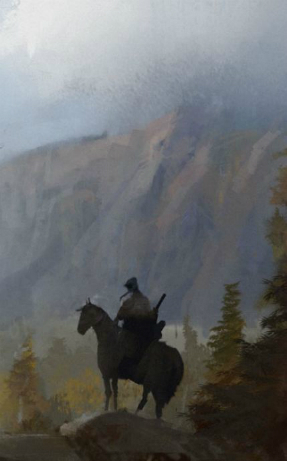 Travelers might even use it as a temporary base from which to work, exploring local ruins, clearing bandits and barbarians from the foothills and helping the camp inhabitants to live a little easier. Excuse the experimental stylings of the map. Right at the bottom of the one you find in the Core Book, this area sits roughly in the middle and you can just about make out a bridge crossing a river near the mountains.